The forgiving 111 boot encourages you to get out on the floor and strut your stuff in the Boost skate. Designed with beginner or recreational skaters in mind, the Boost comes with a durable nylon plate and stylish Radar Riva wheels for exceptional quality from top to bottom. When the music starts it’s time for you to impress while the Boost does the rest. 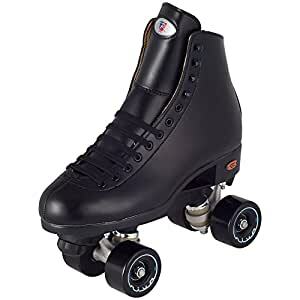 I bought these becasue was tired of renting Skates at rink and getting feet beat up by them. These are great. Though I did not understand that Toe Plugs are not really Toe Stops. That is the only draw back. But other than that they are great.